Situated at the bottom of our customer’s long, tree-lined garden, this attractive Garden Room has been installed in Earlsfield, London to use as a garden retreat for the customer to entertain their friends and family from. 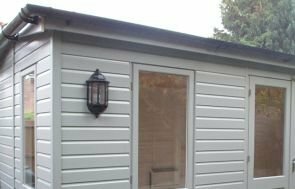 At 3.6 x 4.8m in size, this is a large Garden Room that the customer will be able to decorate with comfortable furnishings for their guests to relax in. The hipped roof has got cedar shingle tiles on for a natural look, and they opted for white guttering to help catch any excess rainwater, and to protect the building. The paint colour the customer chose for their Garden Room is Sandstone, which is a neutral colour and one of the 15 to choose from in the Valtti colour range. Valtti is a multi-layered paint system with a long re-decoration cycle and offers an opaque coverage of paint. The external cladding on this building is weatherboard, which offers more of a rustic look than shiplap, and the customer also opted for inset doors and corner boards to make the Garden Room look more homely. All of the windows in this building are double glazed, and the customer chose to have them Georgian in style: there are two opening windows in the front side, one on either side of the doors, and a double set of opening windows on the right-hand side. There are also two Velux windows in the roof to help allow more light into the tree-surrounded building. 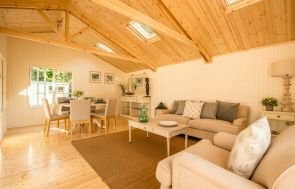 Inside the building, it is fully equipped for year-round use with full insulation, painted matchboard lining on the walls, a Light Oak lacquer on the floor, and the customer also opted for an electrical pack with two heaters (one comes as standard). 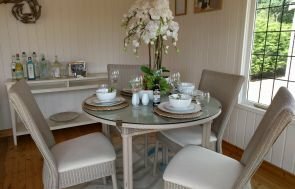 If you would like to know more about our fully-equipped Garden Room or Garden Room with Veranda, you can come and see their quality for yourself at any one of our Show Centres across the country, or you can Contact Us online to ask us any questions you have.